The ‘controversial’ appointment of the new Indian Army chief who assumed office on January 1, 2017 is perhaps the appropriate occasion to discuss the rising uneasiness within the Indian Army on a number of significant issues. While the unconvincing rationale given for the appointment of Lt. Gen. Bipin Rawat as the new Army chief speaks volumes of the deep-rooted tactical thinking within the government, there remains an urgent need to address the lopsided promotion trends in the Army, rising infighting within the force, and their implications for India’s national security. Those who support Gen. Rawat’s appointment arguing that merit was, and should be, the sole criterion for the supersession of two of his seniors fall short on a number of counts. First, to breach a well-established tradition in a conservative and hierarchical institution like the Army, the government should have a convincing and compelling reason which it doesn’t seem to have. Second, the argument of merit is largely redundant at the topmost levels of an organisation where all officers are equally competent, failing which they wouldn’t have made it to the Lt. Gen. rank in the first place. When the Soviet T-72 tank was first deployed, Richard Nixon was President, the F-4 Phantom was America's primary fighter, and the world's steel beasts had yet to discover a nemesis called the wire-guided anti-tank missile. At least 25,000 T-72s have been built, making it the second-most prolific post-World War II tank, coming in behind only the ubiquitous T-54/T-55. That the T-72 is still in service today -- and still being used by about 45 countries, including Russia -- speaks to the longevity of this vehicle. The T-72 began life as a cheaper alternative to the disastrous T-64, a sophisticated mid-1960s tank that proved to be over-complicated and unreliable. First deployed with the Soviet Army in 1973, the 41-ton T-72 featured a 125-millimeter smoothbore cannon. The cannon was fed by an autoloader instead of a human loader, just like the T-64, enabling the vehicle's crew to be reduced to three instead of the usual four in modern tanks. However, unlike the T-64, the T-72 didn't try to feed the crew's limbs into the gun. It’s easy to see the existential threat posed by nuclear weapons. Same goes for global warming. But are there new technologies that present the same kind of danger? That’s one question we’ve tried to address this year with our expanded coverage of things like artificial intelligence, cyber security, and automated warfighting. In addition to some excellent articles about new biotechnology (more on that here), below are five of the best pieces we’ve featured under the banner of emerging technology. It’s hard to underestimate the importance of underwater fiber-optic cables—not just for everyday communications but for critical military and financial transactions. And yet, according to Bryan Clark of the Center for Strategic and Budgetary Assessments, “changes in undersea warfare threaten to undermine … essential underwater infrastructure like submarine cables.” Clark gives a helpful overview of those changes, especially the “unmanned revolution” that has the potential to upend maritime stability—including nuclear deterrence—as we know it. It’s also worth mentioning that James Holmes of the Naval War College discusses that same threat to deterrence as well, in a companion article from the same issue of the journal. What does it mean for humans to merge with their machines? The question is not as new as it might sound, and in this lucid essay Brad Allenby traces the Western version of the idea from medieval Europe through the Enlightenment and the Industrial Revolution to the present day. At a time when technology seems particularly invasive, this article does a good job of reminding readers how much work has already gone into the problem—and how far along the merger already is. Although the ISKP is at a disadvantage, several factors could help it rise again in 2017. During the outgoing year, the Islamic State in Khorasan Province (ISKP), which once emerged as a formidable threat to peace and security in the AfPak region, was pushed back from several districts in eastern Afghanistan. Still, the group’s defeat is seen as a short-term phenomenon. There are several factors that could reinvigorate this beleaguered group in a region fraught with internal and external disputes. Despite a long war in Afghanistan, the regional powers are still far from reaching a consensus on how to end the bloodshed and find a win-win solution for all. Recently, we have seen the re-shaping of alliances and re-balancing of interests in this strategically important region. Countries who were bitter rivals during the period of Afghan jihad are coming closer while those who remained aloof are actively expanding their role in Afghanistan. WASHINGTON — President Obama’s advisers wrestled with an intractable problem in the spring and summer of 2015: How could they stabilize Afghanistan while preserving Mr. Obama’s longtime goal of pulling out the last American troops before he left office? As it happened, the president solved the problem for them. In early August of that year, when Mr. Obama convened a meeting of the National Security Council, he looked around the table and acknowledged a stark new reality. What Mr. Obama meant was that no one in the Situation Room that day, himself included, thought that the United States — after 14 years of war, billions of dollars spent and more than 2,000 American lives lost — would ever transform Afghanistan into a semblance of a democracy able to defend itself. At the same time, he added, “the counterterrorism challenges are real.” As bleak as Afghanistan’s prospects were, the United States could not afford to walk away and allow the country to become a seedbed for extremists again. A few weeks later, the president halted the withdrawal and announced that he would leave thousands of American troops in the country indefinitely. If 2016 taught us anything, it’s that the world is an unpredictable place. Few analysts a year ago would have foreseen both the Philippines and the United States electing populist, iconoclastic, and at times gleefully offensive presidents; North Korea conducting not one but two nuclear tests; the Philippines winning a massive legal victory over China in the South China Sea yet moving quickly to embrace Beijing; or South Korea’s legislature voting to impeach the president after massive protests. At the same time, behind these unexpected happenings were developments that were very much to be expected: continued militarization in the South China Sea, insecurity and violence in Afghanistan, flaring tensions in India and Pakistan over Kashmir, and strained cross-strait relations. Each January, we ask The Diplomat’s authors to lay out what to watch for in the next 12 months. Predicting concrete happenings is an exercise in futility, but the underlying trends driving events are more easily recognizable. Below, our authors provide an overview of what to watch for in the Asia-Pacific in 2017 and how international and domestic factors will shape the future of the world’s most dynamic region. The world’s most populous country is looking to increase its share of the planet’s resources and political influence. The year 2017 could witness a new phase of détente and reset among the great powers with transactional diplomacy and pragmatism driving strategic choices in Washington, Moscow and Beijing. China’s rise is a fact. But what it will seek to do with its changing global position remains a subject of debate. Chinese behavior in recent years offers some clues. Xi Jinping’s regime has sought to focus on three basic goals. First, Xi’s ascent in 2012 has seen the Communist Party of China narrow factional differences to strengthen the Party’s command and control. The preceding decade of massive industrialization was accompanied by a weakening of the Party’s hold on power as patronage networks and systemic corruption mushroomed across the political economy. Xi’s seemingly unchallenged status at the apex is probably more an outcome of elite consensus that short of a drastic political re-centralisation, China was poised for fragmentation and social turmoil. Keeping China united and stable under the Party’s leadership has been the raison d’être for Mao Zedong and his successors. For Xi, this too takes precedence above everything else. It's all very well to be intimidating, but the Asian giant needs to win people over too. China is eagerly trying to win hearts and minds in politically and economically crucial states, especially those with abundant natural resources. In foreign policy terms, this is a push for what’s widely known as “soft power” – the ability to win other states over to specific goals without the use of force. It is a major priority for Beijing. The Chinese state is well-equipped with “hard” power, but its global influence is nonetheless stymied by two serious obstacles: on the one hand the language barrier, and on the other the country’s fearsome reputation as a military and geopolitical superpower on the rise. The difficulty of Mandarin Chinese, with its dizzying numbers of complex characters and tones, remains one of the main stumbling blocks. Nonetheless, Chinese language classes are spreading around the world on the back of China’s rise as a major political and economic force, and Beijing is helping them along: more than 300 Confucius Institutes have been rolled out to 94 different countries since 2005, with a mission to promote Chinese language and culture abroad. Russia has acknowledged that its newest special operations unit, the KSO (Special Operations Command) has been operating in Syria. KSO was being discussed in Russia since 2013 but little was revealed officially. KSO appeared to be an elite Russian special operations unit more like the British SAS or the American Delta Force than the less selective special operations personnel Russia had favored in the past. It also became known that KSO has fewer than a thousand personnel, most of them operators (commandos) and all are volunteer professional soldiers who not only operate like their Western counterparts but have been seen using some of the same equipment. This includes special rifle sights, military rifles and high-end protective gear. Most of this stuff is available commercially, although often only to government agencies (to keep it away from criminals). Like their Western counterparts Russian special operations troops are trained to do a variety of missions. These include reconnaissance (often deep into enemy territory), provide security for very valuable people or equipment and carry out “direct action” (raids).Russian spetsnaz (the less selective predecessor of KSO) did this in Afghanistan in the 1980s and in the Caucasus since the late 1990s but not in Syria. That’s because Russia wants to avoid casualties in Syria as these are very unpopular in Russia. Spectacular victories, on the other hand, are still popular and Russia had figured out how the West had used more highly skilled operators (like SAS and Delta) as a backbone or spearhead for other special operators in special situations, like Afghanistan in 2001 and for the effort to kill bin Laden and many other senior Islamic terrorist leaders and, more importantly, capture useful secrets most of these men had with them. It turned out that KSO was a key element in making the quick takeover of Crimea work. KSO is still a threat to Ukraine but it was apparently intel and advice from KSO operatives that prevented Russia from getting into even more trouble in eastern Ukraine (Donbas). Russia and United States détente’ is a geopolitical imperative in 2017 for global stability and security when placed in context of China’s unbridled provocative military rise. Russia and the United States in the post-Cold War era have failed to establish cooperative security management, both regionally and globally, chiefly because of the ‘China Factor’ that plagued both Russia and United States policy perspectives and formulations. United States despite emerging as the unipolar Superpower persisted with Cold War apprehensions that Russia was still the potent threat to United States and that needed to be manged by American strategic and political reach-out to China. 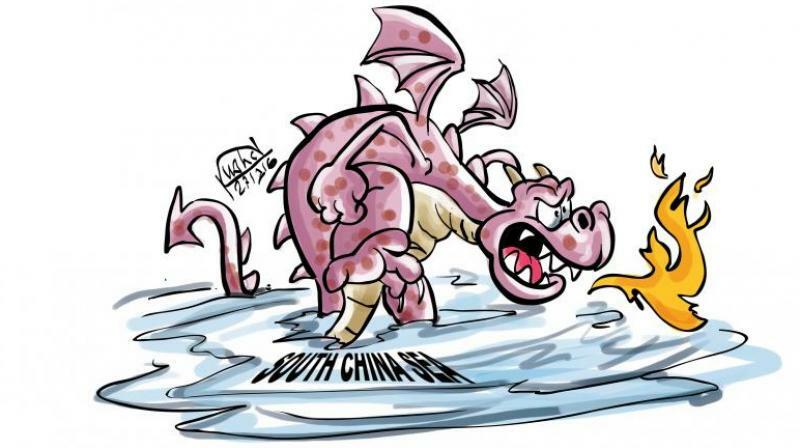 Russia strategically down and out then perceived that it needed China for its resurgence and return to its global equivalence with United States. Thus emerged the Russia-China Strategic Nexus as a marriage of convenience dictated by prevailing geopolitical compulsions upto well past of the first decade of the 21st Century. It was a poor attempt to balance United States strategic predominance. Russia’s and United States stood frozen in their respective threat perceptions for a decade and a half. Resultantly, China as the beneficiary of strategic munificence of both United States and Russia zoomed fast forward to emerge in 2017 with pretensions of being the second pole in what China perceives as a bipolar world comprising United States and China. – I am deeply offended by the lies being told by the US Government – and more specifically, by the Central Intelligence Agency (CIA), Federal Bureau of Investigation (FBI), and Department of Homeland Security (DHS) with the explicit approval of the Director of National Intelligence (DNI) and the President – with respect to the Russians “hacking” the US election. As Donald Trump prepares to assume this charge, U.S. nuclear policy finds itself historical crossroads. The incoming administration will be presented with at least five tensions that will force difficult choices for the future of American nuclear strategy. First, the world is in the midst of a technological transformation that threatens to undermine both the idea and the reality of strategic stability based on mutual vulnerability between nuclear-armed states. For decades, advocates of what Robert Jervis called the “nuclear revolution” emphasized the inalterable facts of the atomic age: clean first strikes that eliminated an adversary’s ability to unleash a devastating nuclear response were next to impossible, as were perfect defenses against a nuclear attack. Once a state secured its ability to retaliate to a nuclear strike with forces of its own, there was little point in building more or better nuclear weapons. Seeking nuclear primacy, in other words, was pointless, since greater numbers of nuclear weapons could not change the basic fact of mutual assured destruction. Brendan Green and Austin Long, as well as Daryl Press and Keir Lieber, have conducted trailblazing work to reveal that the United States never fully accepted the premises of mutual vulnerability. In reality, it tried very hard over the years (with varying degrees of success) to escape it. The United States invested extraordinary sums over decades to produce what Press and Leiber term the “counterforce revolution.” Massive improvements in missile accuracy, stealth, and speed, combined with increased sensory and computing power, make today’s nuclear balance far less stable than once thought. Furthermore, as Long highlights, the United States needed to pursue primacy and damage limitation strategies if its extended deterrent relationships with allies were to remain credible. After two years of teaching at the Australian Army’s School of Armour, he reports, “My primary takeaway from this assignment is that Australian mounted tactics training at the company level and below is much better than our U.S. tactics.” They’re notably better at live fire training, he adds. Tom intervention: The interesting thing to me is that intelligent people sense this state of affairs. That is, if a military school has high standards and teaches valuable skills, graduating from there will mean something to other soldiers. As Buckeye notes, “Graduation from Armoured Corps ROBC carries a degree of prestige that is noticeably missing when lieutenants graduate from ABOLC.” In other words, you don’t need to talk about being the best if you can walk the walk. THE MOST predictable crises the new administration will face will involve failed states, mired in seemingly permanent civil war. These states generate terrorism that threatens Americans abroad and at home. They generate humanitarian crises into which Washington feels pressure to intervene. And they generate refugee crises, sometimes of enormous proportions. Syria currently offers the worst example of such geopolitical disaster areas, but many other states, especially in the Middle East, could easily follow its catastrophic path. If recent history suggests anything at all, it is that the United States most often has no good solution to the problems of failed states. Indeed, virtually any action it takes to resolve these problems has the potential to make things worse, or to create new problems elsewhere. New administrations seeking to make their mark with solid achievements will not want to believe this message, and may only come to recognize its truth through bitter experience. But the bitter experience can be minimized if the new administration’s foreign-policy and defense teams keep in mind the following points. The reason I have lumped NAVSPECWARCOM (or, “WARCOM”: Naval Special Warfare Command), AFSOC (Air Force Special Operations Command), and MARSOC (Marine Special Operations Command) into one article is simple: the rest of SOCOM outside of JSOC and USASOC are either bad fits (MARSOC) or too niche to really take up that much time on. When talking the Navy, we’re mainly talking the SEALs. Sure, there are other parts of WARCOM, but it would be like spending a lot of time on the 528th Special Operations Sustainment Brigade. These elements are immensely worthwhile, but do not drive much of the agenda within SOCOM. With AFSOC, there are two main groups: pilots and special tactics personnel. Within the special tactics, AFSOC has, among others, pararescuers and combat controllers. These forces are legitimate special operators, but they have a very niche mission and are mostly made up of NCOs, so, again, not likely to control the bureaucracy at SOCOM, therefore we will spend most of our time on reference AFSOF on the part made up of pilots and airframes. MARSOC, as will be explained, was forced on SOCOM and the USMC by Donald Rumsfeld after 9/11, and has never really been comfortably incorporated into the SOCOM fold. Of these elements, WARCOM has done the best in influencing SOCOM, most times in much better ways than ARSOF (Army Special Operations Forces) have. Philippines – 2016 saw a huge number and variety of cyber attacks, ranging from a high-profile DDoS using hijacked Internet-facing security cameras to the alleged hacking of party officials during the US election. The year also saw a rising tide of data breaches, from organizations big and small, and significant losses of people’s personal information. Destructive DDoS IOT attacks will rise. In 2016, Mirai showed the massive destructive potential of DDoS attacks as a result of insecure consumer IoT (Internet of Things) devices. Mirai’s attacks exploited only a small number of devices and vulnerabilities and used basic password guessing techniques. However, cybercriminals will find it easy to extend their reach because there are several IoT devices containing outdated code based on poorly-maintained operating systems and applications with well-known vulnerabilities. Expect IoT exploits, better password guessing and more compromised IoT devices being used for DDoS or perhaps to target other devices in your network. Russia’s military laid out what is now seen as a blueprint for cyberwarfare with a 2013 article in a professional journal by Gen. Valery Gerasimov, the chief of Russia’s General Staff. At the time, Russia’s military was absorbing the lessons of the Arab Spring, when social media played a key role in mobilizing leaderless protests that upended the political order across North Africa and the Middle East. Now that doctrine is likely to come under more scrutiny following new U.S. sanctions that target Russia’s military intelligence agency, the Main Intelligence Directorate, or GRU, as well as the country’s Federal Security Service, the successor to the Soviet-era KGB. Some of us questioning our capacity to carry the responsibility that comes with democratic rule these days might sympathize with this idea. To those we must apologize: decision-makers will still show up in human form to Davos in 2017. The “moral machine” won’t be real, but it will be the centerpiece of a design exhibition where artists and scientists explore the power that algorithms may soon wield over our lives. It asks a provocative question: What if we were led by machines that know us better than we do? In some ways, tech in 2017 will be a steady progression from what came before it. Time marches on, and so too does the advance of technology. In other ways, though, it will be just as upended as the rest of the world by the unprecedented disruption that 2016 has left in its wake. The artificial intelligence revolution is well and truly upon us, but so far, the biggest players are venerable Silicon Valley titans such as Google, Amazon and Apple. That’s partially because they have the money to hire teams full of PhDs at seven-figure salaries, but it’s also because they have the data. That could change. One of the key areas of research for 2017 is data efficiency: the problem of trying to teach machine-learning systems how to do more, with less. Think about how many times your average three-year-old needs to see a particular animal before they can correctly identify it, compared with the thousands of images a neural network needs to ingest to perform the same basic task.